The European Court of Human Rights has rejected an appeal by the Irish government against the ruling that the UK did not torture the so-called 'Hooded Men'. The group claimed they were subjected to torture by the Army in 1971. The Irish government was appealing the European court's ruling from March. In 1978, the European Court of Human Rights held that the UK had carried out inhuman and degrading treatment, but fell short of defining this as torture. In 2014, the Irish government said it would ask the European Court to revise the 1978 judgement. 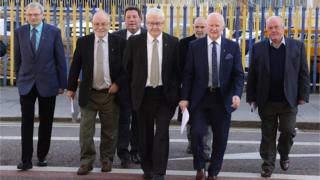 The 14 hooded men released a statement stating: "This judgement is disappointing, we had hoped the Grand Chamber of the European Union would have corrected this injustice in that forum, for the sake of the integrity of the court and survivors of torture all over the world. "We are supposed to be living in an era where human rights litigation is victim-centred. It is disappointing that the decision reached by the Grand Chamber was taken without first affording the men an opportunity to address the court in their capacity as directly affected persons." The hooded men allege they were subjected to state-sanctioned torture. They said they were forced to listen to constant loud static noise; deprived of sleep, food and water; forced to stand in a stress position and beaten if they fell. They also said they were hooded and thrown to the ground from helicopters - despite being at near ground level, they had been told they were hundreds of feet in the air. On Tuesday, the ECHR found the Irish government had failed to demonstrate the existence of new facts which would influence its original judgement. The revision of the request was dismissed by six votes to one by the European court's Grand Chamber. It ruled: "The original judgment had stated that the difference between "torture" and "inhuman and degrading" treatment depended on the intensity of suffering, which in turn depended on a number of elements. "It was not clear that the one element of long-term psychiatric suffering would have swayed the court into a finding of torture." Amnesty International described Tuesday's decision as a "bitter blow". Grainne Teggart, the organisation's Northern Ireland campaigns manager, said: "Today's decision is a bitter blow for the men and their families. The European Court has failed to let the Grand Chamber consider Ireland's request to right a historic wrong. "When Amnesty visited the detainees in 1971, we found clear evidence of torture. Our assessment has not changed in the years since and today's decision does not change this. The torture of these men was approved at the highest level of government. Justice is long overdue. "We need an independent and effective investigation in line with the UK's international human rights obligations. Those responsible for sanctioning and carrying out torture, at all levels, must be held accountable and, where possible, prosecuted." Darragh Makin, solicitor for the hooded men, said they still maintain that techniques used on them were torture. "The campaign for justice for The hooded men is not over," he insisted. "They now eagerly await the judgment by the Court of Appeal in Belfast in which the Chief Constable of the PSNI appealed a decision that requires the identification and prosecution of those individuals whom perpetrated and authorised the techniques are held accountable." Francis McGuigan, one of the hooded men said: "Whilst today is yet another setback, it is by no means the end. We have already received a legal ruling confirming our treatment was torture. It is disappointing that the European Court missed an opportunity to correct such an unjust ruling, however we now eagerly await the Court of Appeals decision, and seeing those responsible held accountable."